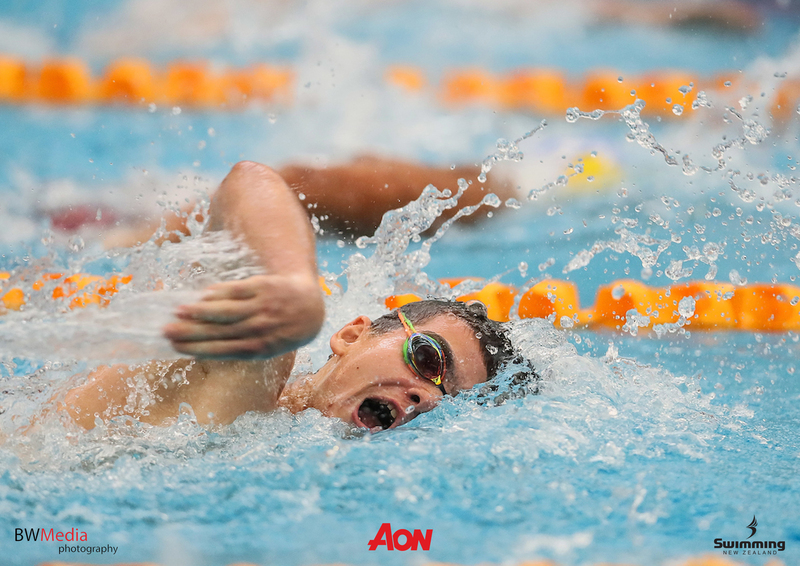 Lewis Clareburt and Bre Crawford were in record breaking form on day 3 of the 2018 Aon NZ Age-Group Championships. Clareburt, 18 (Capital), scratched from the 400m individual medley to concentrate on the 200m freestyle. In the final, Clareburt established an early lead from Zac Reid (Aquaknights), and pushed hard into the wall to win in 1:48.32s, breaking his own 18-years national age group record. “I just to try back up every swim that I do and have fun doing it,” Clareburt said after the race. Reid was second in 1:51.44s and Tyron Henry (HPK) third in 1:53.15s. Clareburt returned to the pool twenty-five minutes later to break the 18-years national age group 100m freestyle record set by Daniel Bell in 2009. Clareburts time of 50.38s was set as the lead off swimmer for Capital swim club in the 4x100m freestyle relay. Crawford, 15 (MAGS), won her fifth and sixth title of these championships in the girls 15-years 50m butterfly and 100m breaststroke finals. In the butterfly final Crawford set a new national age-group record and personal best of 27.37s. Crawford yelled “yes,” as she turned around to see her time on the scoreboard. Alice Waldow (United) was second in 28.46s and Jessica Scott (Neptune) third in 29.06s. May Toven from New Caledonia won the visitors bronze medal in 28.50s. 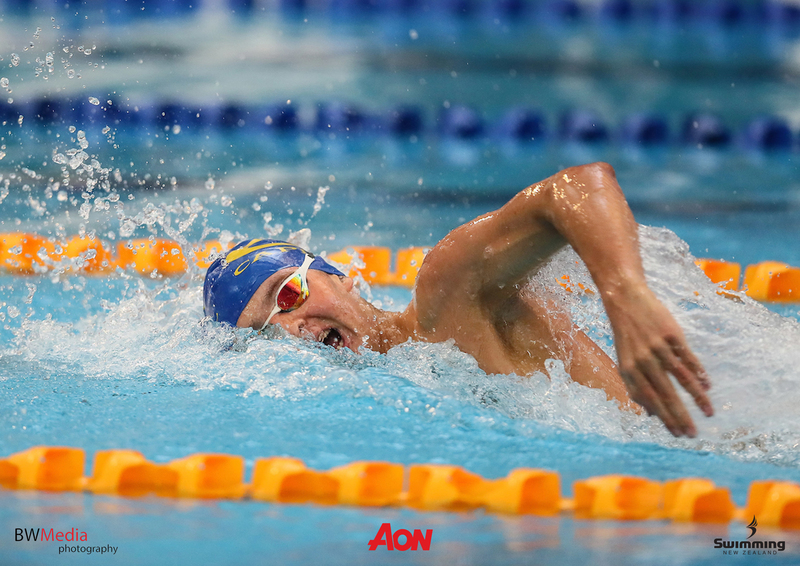 In the 100m breaststroke final Crawford won by over six seconds in another personal best time of 1:12.73s. Mackenzie Brears (Pukekohe) was second in 1:18.92s and Tavarnya Howe (Pukekohe) third in 1:19.00s. SwimZone’s Pierce Collins, 13, won the boys 12-13 years 50m butterfly and 200m freestyle titles. 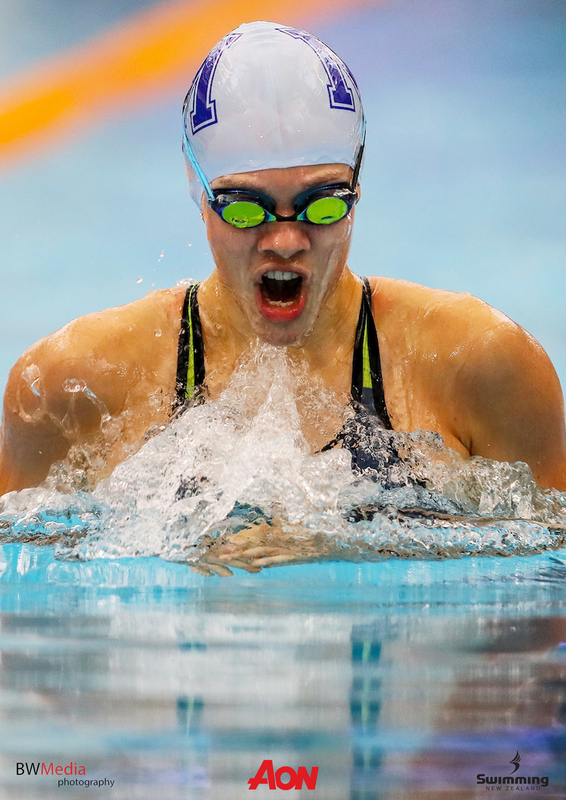 Collins won the butterfly in a new personal best of 27.77s, but had to fight hard to win the 200m freestyle final. Collins was in fourth place at the 150m turn before overhauling John-William Dabin (New Caledonia), Ethan Watson (United) and Zach Knowles (Waitaha) to win by 0.01s in 2:06.46s. Earlier in the competition Collins set a new 13-years national age-group record in the 200m butterfly. Girls under 15 years and under club winner: Neptune (Scott, McCane, Hutchens, Fairweather). Time: 4:05.34. Boys under 15 years and under club winner: North Shore (Poching, Kim, Gray, Garrod). Time: 3:42.59. Girls 16 years and over club winner: United (Miln, Alexander, Smolcic, Falconer). Time: 3:54.90. Boys 16 years and over club winner: Capital (Clareburt, Wilson, Julian, Watkins). Time 3:29.00.